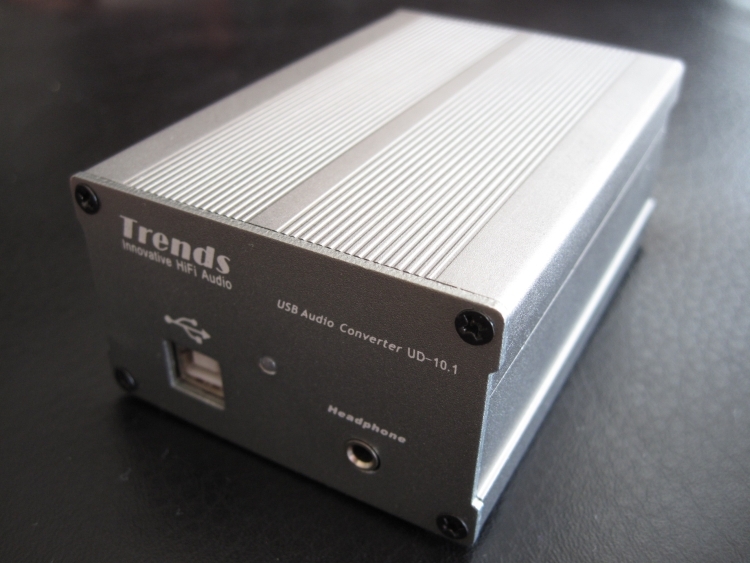 The UD10.1 is a compact, affordable USB Interface that not only interfaces between computer and DA converter, but is also a DAC and offers a headphone output that is bi-useable for regular analog output by using the supplied jack-cinch adapter. This is a follow up review of the Trends UD10.1 Lite, the lite version of the UD10.1 reviewed here. Since the two interfaces are largely identical, I’ll just explain the differences here, without repeating what’s written in the Lite review. Please see that review for more detailed info. The UD10.1 has 4 outputs as opposed to the UD10.1 Lite’s 2. 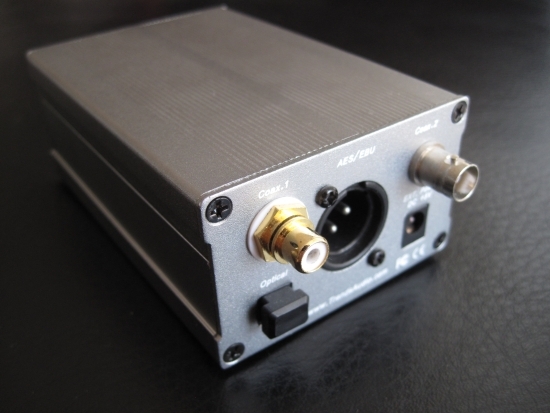 In addition to coaxial and optical, there’s now also BNC and AES/EBU. What’s more: these outputs have individually been transformer-decoupled. According to the manufacturer’s website, the clock has been improved and indeed, if size is a measure, it has been improved by a factor two. As far as I can tell with my limited electrotechnical knowledge, nothing else has been changed. There are more components on the 10.1’s circuitboard but if anything they seem to cater to the extra outputs. There is one more power regulator on the board though. The two units are identical in size but the UD10.1 is a little higher than the Lite and also has a nicer, more luxurious looking surface in a Titanium colour. 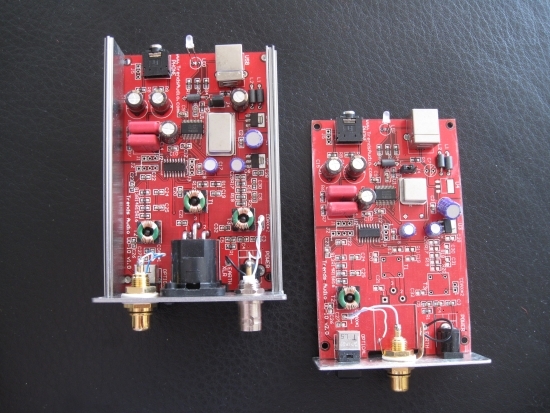 This interface, like the UD10.1 Lite, offers a Burr Brown PCM2704 converter for analog output, and also offers connection of an optional Charger Kit, consisting of a plastic container and 4 chargeable AA penlites. A charger is also included in the optional pack. The battery pack has an on-off switch and that’s important because one charge will give you a quoted 16 hours of playback time. While that’s certainly enough for any listening session (surely I haven’t ever exceeded that;-) it would nevertheless be unfortunate if you forgot to switch it off and have no juice left for the next day. But even that’s covered, because the UD10.1 also works on USB bus power. 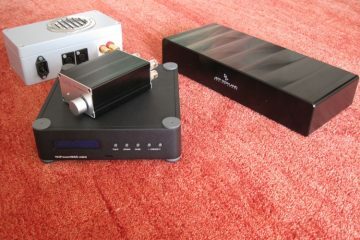 As mentioned, the UD10.1 has more outputs than the Lite but I only tested the coaxial output. 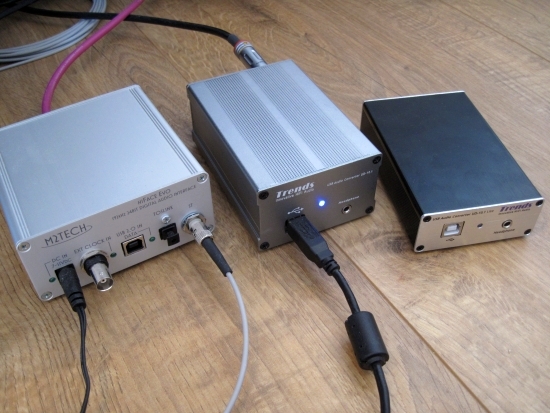 From experience I know that BNC tends to sound more precise and AES/EBU tends to sound more controlled yet less enthusiastic, hence my preference for coaxial. Take note though: the UD10.1 Lite maxes out at 16 bits and takes samplerates up to 48khz only. Play 96khz file and it still plays, but gets truncated to 48khz. So, how does the UD10.1 compare to the UD10.1 Lite? Even when powered from the USB bus, so without external adapter, the UD10.1 performed very well. It was immediately evident that it has a much smoother, more fluid and more refined character than the UD10.1 Lite. I quite like a bit of smoothness and found the UD10.1 Lite, albeit very enthusiastic, to be a little too forward. I called it “rough ‘n ready”. The UD10.1 is quite different. It is more gentle, more suave and doesn’t shout unless it needs to. I do realise that some people actually like their sound upfront, loud and dynamic. If you are like those people and can forgive a little roughness around the edges, then the UD10.1 Lite may be better. for me though, there is no question. My Magnepans are plenty open and reveal more that I sometimes like and it is with these speakers that the UD10.1 has better synergy than the UD10.1 Lite. 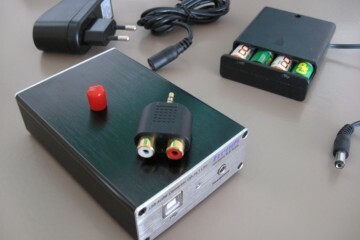 An external power supply wasn’t in the package and unfortunately I didn’t have a 5-volt adapter around the house (the one I did have that is specified at 5 volts actually outputs way more so I didn’t dare connect it). So I had no choice but to leave this option out. This was going to be interesting. The HiFace EVO sounded quite a bit better to me than the UD10.1 Lite but given that the 10.1 is much more refined than the Lite, it should become a more equal fight. And indeed: the UD10.1 came closer to the HiFace than the Lite did, but was comparably still a little rough around the edges. It has a little bit more slam than the EVO but the EVO was more gentle and refined and airier, more sophisticated treble and also better soundstaging. The manual clearly states to be careful with this. Before connecting an external power supply (and I suppose the battery pack counts as that) you need to unplug the USB cable. With the UD10.1 Lite I had some problems with the sound cutting out intermittedly after connecting a power adapter that output much more than its specified 5 volts and I figured that I might have damaged the unit. But as it turns out, the UD10.1 has the same behaviour so I guess that somehow the USB bus and the external power source are colliding. When it worked though, the sound was very noticeably better than without the battery pack. Most obvious was the soundstaging. Where the UD10.1’s soundstage was a bit crammed and congested when fed by USB power, with battery power it was much more like the EVO: a wide and deep soundstage with good central focus and lots of air inbetween. What remained though, was its slightly hot and rough treble. Even with batteries, the UD10.1 sounded more driven and dynamic than the EVO and for some people that may be a good thing, for me (and my Magnepan speakers) it was a little too much. Ultimately, UD10.1 can’t match the performance of the HiFace EVO. But in absolute terms the UD10.1 isn’t that much behind, and so in light of its low 175 euro price (less than half the EVO’s price), it offers very good performance indeed.